Sadly in 2013 I lost a great friend and the beading world lost a great artist, Merle Berelowitz. Before she died Merle and I partnered on a project where I made a lariat using her wonderful hand-painted flowers. The instructions for the lariat were to be offered as a kit, along with a selection of her colourful flowers, but sadly Merle passed away before this was possible. Merle was a great lover of colour and flowers and it is in her honour, and that spirit, that I am offering the instructions for the lariat to you all as a gift in the hope that doing so will result in more colour and flowers being spread. 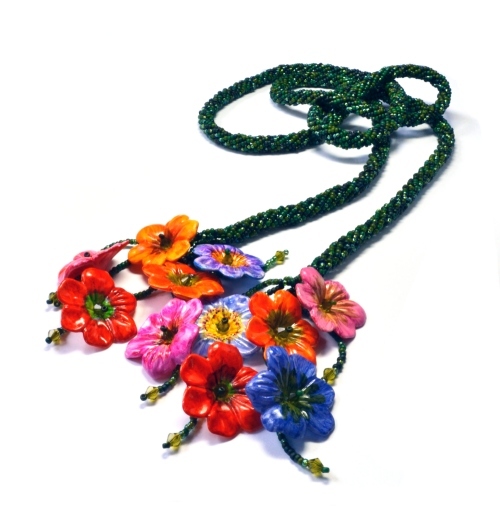 Whether you bead the lariat using other purchased flowers, or by adding in flower instructions from elsewhere, I hope it brings colour and happiness to your life and reminds you of all the beauty in the world. You can see some of Merle’s work on her website and purchase some of her flowers at: www.msmaddiesbeads.com.